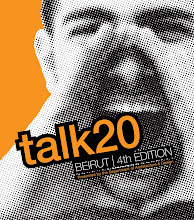 This is a short video about Talk20 edition 3, prepared by Roudy Khalil, from the show Mazaj on Future News Tv channel. BEIRUT: Variety and brevity - a lot of acts, none of them lasting long enough to become tedious - were among the virtues of vaudeville. The spirit of that antique form has found a home in Talk20, which attracted a capacity crowd to the American University of Beirut's Hostler Center on Friday evening for two hours of presentations - this despite the driving rain. The informal event saw Lebanese artists, designers and architects take the stage alongside AUB students to present casual presentations. The brief was simple. Each participant was permitted 20 slides, with each slide, and accompanying chatter, showing for 20 seconds. 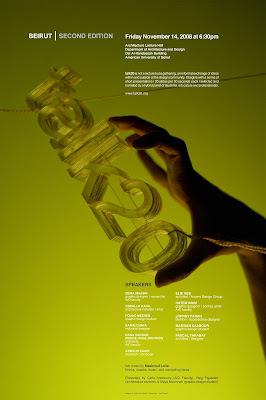 Produced in a variety of cities around the world, Talk20 events happen locally within a global network of practitioners interested in promoting greater exchange between creative professionals and a wider audience. 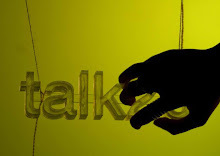 By giving each presenter a 20-slide, 20-second limit within an otherwise relaxed environment, Talk20 seeks to break down the borders of status in favor of unhindered interaction. "Pretentiousness can be a problem in Lebanon ... that blocks the exchange of creative ideas," said organizer Carla Aramouny, who founded brought the event to Beirut. "We want to work on enhancing the networking aspect of the event, so everyone can get connected in a positive way." 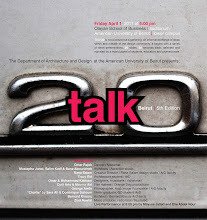 "Talk20 is not a lecture but a gathering," reads the ubiquitous website blurb, "an open forum for the dissemination of ideas in art, architecture, and design." The third edition of the Beirut event included Katrine Holmfeld and Mirene Arsanios of the Lebanese Association for Plastic Arts (Ashkal Alwan), video artist and co-founder of the Beirut Art Center Lamia Joreige, just returned from the Sharjah Biennial, and animation artist Lina Ghaibeh and graphic artist May Ghaibeh. They shared the stage with, architects Karim Najjar, Bernard Mallat and Raed Abillama and AUB architecture students Joey Abu Jawdeh and Anthony Khoury, landscape architects Maha Issa and Gamar Markarian, musician and vocalist Salma Mousfi and DJ Jade, fashion designer Milia Maroun, and a student group who chronicled their AUB-sponsored trip to India under the name "India x20." Within its 20x20 timeframe, participants expounded upon their artistic and cultural output. Organizers hope that this forum will serve to kick-start a dialogue among Beirut's frequently diffused creative community. The constraints provoked a variety of responses. Some participants took a relatively straightforward approach. Holmfield and Arsanios, for example, used their 400 seconds to explain the various activities of Ashkal Alwan - which is responsible for the Home Works Forum on artistic practices, and is building up an archive of contemporary Lebanese art. Other speakers used their slot as a creative opportunity in its own right. Landscape architects Issa and Markarian created an imaginary narrative with the starting point of a handsome man in a bar asking the dreaded question, "So what is it exactly that you do?" The talk meandered through a variety of possible responses, taking in several rounds of drinks and competition from a rival woman. Along the way, spectators discovered the joys and frustrations of being a landscape architect, and the fact that for each Beirut resident there is less than one square meter of green space. A number of presentations spoke to the frustrations to creativity in Lebanon. Architect Bernard Mallat explained his concept of "architectural tai chi," in which he endeavors to use Lebanon's constricting building regulations against the planners themselves. Some participants built their talks around more abstract themes. Milia Maroun used her allotted time to reflect on the idea of recognition and how an artist should respond to success. Accompanying her musings were a series of backstage stills from the latest collection of her brand "Milia M" in Milan. Singer Salma Mousfi discussed the "filters" that an artist must use in creating a work. She guided the audience through the process of creating her latest album, "Salmanova," explaining how she "filtered" the various possibilities at each stage: The studio, the producer, the instrumentalists and the artist for the album cover. The Ghaibeh twins provided a particularly charming 400 seconds. Standing side-by-side, looking utterly identical, they discussed their artistic exploration of their identity as twins. In one slide, they had superimposed the left-hand side of Lina's face on May's right, and vice-versa. It was clear from the resulting asymmetric images that they are not in fact identical. On the other hand, they told the audience, twins are actually more similar to each other than clones. Since they originate from the same egg, they have one extra characteristic in common. In a short video, the twins re-enacted a recurring dream in which their twin disappears into an elevator, never to be seen again. "The event shows students that there are a large number of people actually out there and doing something," Aramouny said, noting that the event works to encourage students from AUB and other Lebanese universities to remain motivated in their work. Though students from architecture, design, or other creative fields were present, the audience included a variety of disciplines and simply curious passersby who heard about the event by word of mouth. Fans of Mashrou3 Leila, who played a few songs to introduce the event, lingered after the music finished to watch Talk20's eclectic mix of presentations. "Creative work in Lebanon is often done in isolation," lamented Aramouny, underlining the need for such an event to connect Lebanese professionals in creative disciplines. She mused that a sea change is underway. "There is a vibe now to bring the art to the public, to make art a livelihood," she said. "You feel in Beirut a vibe to bring art closer to the people, art is becoming a trend ... it's an interesting moment to be experiencing here now." Another article featured in the Daily Star about Mashrou3 Leila, who played in both the second and third editions of talk20. Mashrou3 Leila is a band formed by a group of AUB students, most of them from the Architecture and Design department: Firas Abou Fakher, Ibrahim Badr, Andre Chedid, Carl Gerges, Omaya Malaeb, Haig Papazian, and Hamed Sinno. BEIRUT: "Mashrouaa" means "project." "Leila" means "night." It also inspires the orientalist imagination to wander back through the centuries, conjuring up beautiful women named Leila, creatures of mystery and seduction. Put the two together to get "Mashrou3 Leila," and it becomes a seven-member band - average age 22 - that is shaking up the Beirut music scene with a new fusion of Arabic and Western musical influences that can only be labeled "alternative." At first, it seems the only thing that violinist Haig Papazian, guitarists Andre Chedid and Firas Abou Fakher, keyboardist Omaya Malaeb, drummer Carl Gerges, singer Hamed Sinno, and bassist Ibrahim Badr can agree on is being "100 percent Lebanese" - echoing one of the consumer-insurrection branding exercises brandished during the carnival-esque demonstrations of 2005's Beirut Spring. The fruits of their collaboration - and the alacrity with which they finish one another's sentences - suggest the musicians have more in common than their nationalities. They have harnessed their different musical influences to the task of writing songs seeking to bridge East and West - which they feel speaks to the complicated, tragic, yet hypnotizing spirit of Beirut. "We're writing our own music and referring to different genres, while at the same time being none of them," said Papazian and two or three of his band mates. He defines the objective of the band to "cross the line between underground and pop music to deliver good music to a wider audience without categorizing [ourselves], to reach as many people as possible." The band members claim they never intended to get themselves recognized, or to be taken seriously, or to win a record deal last month at a battle-of-the-bands-style contest held at Basement last month, sponsored by a local FM radio station. The band started jamming together as part of an experimental workshop at the American University of Beirut's Architecture and Design Department. The band members say they merely intended to have fun and express themselves, to tap into another creative outlet. Mashrou3 Leila had its first big break being at the Fete de la Musique - the francophone musical celebration of the shortest night of the year - on June 21, 2008. "Many people started writing about us in their blogs," said Papazian, "and it was then that we started to take this more seriously." With many fans waiting in eager anticipation of their first album - scheduled to be released before the end of the year - and with the band members on the verge of graduating from university, Mashrou3 Leila is as eager as everyone else to see where all of this will lead the band. So far, the seven band members have composed 14 narrative songs, depicting various facets of daily life in Beirut. The band isn't striving to communicate themes of idealized love - like you sometimes encounter in conventional Arabic pop music - but a grittier urban reality that, as Papazian said, "provides lots of opportunities while at the same time holding you back in a lot of ways." "There is no way we could write songs out[side] of Beirut," said Chedid, highlighting the bright thread that seems to string the band together. "A lot of our creative energy comes from being in Beirut," Abou Fakher agreed. Like many local alternative groups, Mashrou3 Leila composes its lyrics in Arabic. Like them, the band's mosaic of colorful cultural and musical inspirations draws a wide base of fans loyal to different genres. The choice of having the band's hybridized music speak Lebanese Arabic captures the spirit of Beirut and the people who call it home. The band wants "to reach people in a more direct way," Papazian says, joking that maybe this is "an alternative approach to what Arabic music should be like in the 21st century." As for what it's like to work together, diversity is not always an advantage. The band members agreed that although the greatest challenge lies in finding time to practice together across seven schedules, the next difficulty is their differences of opinion over the direction a song should take. "We have productive arguments," said Abou Fakher with a smile, adding that they also occasionally bring in outside observers with "an objective ear, to help iron out the wrinkles." A series of successful Beirut concerts have brought out ever-larger crowds of vocal fans, something that bodes well for the success of Mashrou3 Leila's debut CD, but no one in the band is holding his breath. Assuming an upbeat tone that belies the uncertainty of the times ahead, band members joked that this is what it's like "living in exciting times." "Let's graduate first," said the pragmatic Badr, "record an album first, and then let's see." This video that shows the first part of talk20-3 was uploaded on the Annahar TV channel on YouTube, produced by Waleed Saab. 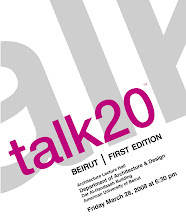 The Department of Architecture and Design at the American University of Beirut is pleased to invite you to the third edition of TALK20 Beirut on Friday March 27, 2009 at 6:30 pm.